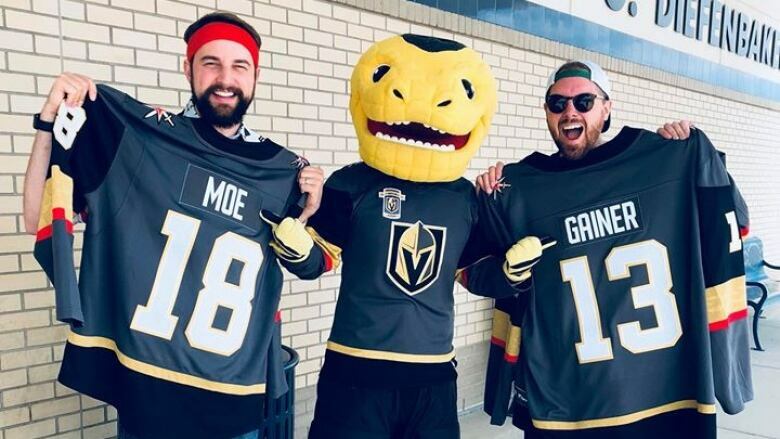 A Saskatchewan internet comedy duo is taking its push to make the Vegas Golden Knights the province's official hockey team to the next level. They've convinced the NHL franchise to make a custom jersey they can deliver to Premier Scott Moe. Justin Reves and Greg Moore went knocking on the doors of the Saskatchewan legislative assembly on Tuesday with an official custom jersey from the Vegas Golden Knights in hand. The name on the back: Moe. "Mr. Moe, we've got your jersey for you," they yelled. "All the way from Chance, the Golden Knights mascot. Go, Knights, go." There was no answer, but that isn't stopping Moore and Reves from trying to convince Premier Scott Moe to adopt the Knights as the province's official team. "We started doing the math and said it absolutely needs to be Vegas," Reves said. "I hope he [Moe] just follows the will of the people." It sounds like all fun and games, but the idea from the internet comedy duo — who are known for the Justin and Greg show — has taken off. They have attracted thousands of views on their YouTube and Facebook videos, and over 300 signatures on a Change.org petition. The Knights are playing along, too. They sent their Gila monster mascot named Chance to Saskatoon on Tuesday so the duo could pick up a personalized jersey for Moe and the mascot of the Saskatchewan Roughriders. Although many Canadians are cheering for the Winnipeg Jets as they face off against the Knights in the Western Conference final, Moore and Reves don't feel they can connect to the fan fever sweeping across the country. Part of the reason? The long-standing CFL rivalry between the Winnipeg Blue Bombers and the Saskatchewan Roughriders. "We're not traitors, we're realists," Moore said. "Blue Bomber fans are the same as Jets fans. They don't like us so why do I have to feel obligated to cheer for them?" Saskatchewan is the only province in western Canada without an NHL franchise. Many of the players on the Knights are Canadian, including Brayden McNabb, who is from from Davidson, Sask. Moore and Reves point out that Regina and Saskatoon both have direct flights to Las Vegas, which are sometimes cheaper than domestic travel. "If you've ever been here in the winter when it's minus 40, do you want to go to Winnipeg where it's also minus 40?" Reves asked. "Or do you want to fly down to Vegas where it's plus 20? It makes a ton of sense." Moe is asking his Instagram and Twitter followers for their opinions. So far, a small majority are with the Knights. But views on whether people in the province should declare the Knights as their own are mixed on the streets of Regina. "I don't think that's going to happen," said Stacy Martin, who is a Knights fan. "I think there's a lot more Jets fans in the province." Others think the province should embrace the Knights without hesitation. "Let's take them," Jeremy Reed said. Moe has declared himself an Edmonton Oilers fan. One of his cabinet members, Ken Cheveldayoff, is brothers with the general manager of the Jets, Kevin Cheveldayoff. Still, the comedy duo is determined their gambling with the premier will pay off. "This team said Saskatchewan we want you to be a part of what we're doing and to me that goes beyond invisible borders," Moore said. "It's time ... Let's go. Go Knights. Go."